Photodiode Many diodes designed for use specifically as a photodiode will also use a PIN junction rather than the typical PN junction. Some photodiodes are similar to a light emitting diode. They have two leads, coming from the bottom. The shorter end of the two is the cathode, while the longer end is the anode. Under forward bias, conventional current will pass from the anode to the cathode. Photocurrent flows in the opposite direction. 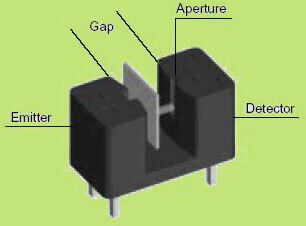 A photodiode has a PN junction or PIN structure. When a photon of sufficient energy strikes the diode, it excites an electron, thereby creating a mobile electron and a positively charged electron hole. If the absorption occurs in the junction’s depletion region, or one diffusion length away from it, these carriers are swept from the junction by the built-in field of the depletion region. Thus holes move toward the anode, and electrons toward the cathode, and a photocurrent is produced. When used in zero bias or photovoltaic mode, the flow of photocurrent out of the device is restricted and a voltage builds up. The diode becomes forward biased and “dark current” begins to flow across the junction in the direction opposite to the photocurrent. This mode is responsible for the photovoltaic effect, which is the basis for solar cells—in fact, a solar cell is just an array of large area photodiodes. In this mode, the diode is often reverse biased, dramatically reducing the response time at the expense of increased noise. This increases the width of the depletion layer, which decreases the junction’s capacitance resulting in faster response times. The reverse bias induces only a small amount of current (known as saturation or back current) along its direction while the photocurrent remains virtually the same. The photocurrent is linearly proportional to the luminance. Although this mode is faster, the photovoltaic mode tends to exhibit less electronic noise. The leakage current of a good PIN diode is so low – < 1nA. Avalanche photodiodes have a similar structure to regular photodiodes, but they are operated with much higher reverse bias. This allows each photo-generated carrier to be multiplied by avalanche breakdown, resulting in internal gain within the photodiode, which increases the effective responsivity of the device. The minimum input optical power to generate photocurrent, equal to the rms noise current in a 1 hertz bandwidth. The current through the photodiode in the absence of light, when it is operated in photoconductive mode. The dark current includes photocurrent generated by background radiation and the saturation current of the semiconductor junction. 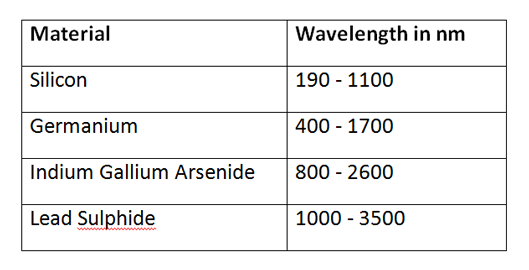 The ratio of generated photocurrent to incident light power, typically expressed in A/W when used in photoconductive mode. The Responsivity may also be expressed as quantum efficiency, or the ratio of the number of photogenerated carriers to incident photons and thus a unit less quantity. There are PN and PIN Photodiodes. They differ in their mode of performance. Due to the intrinsic layer, a PIN photodiode must be reverse biased. The reverse biasing increases the depletion region allowing a larger volume for electron-hole pair production, and reduces the capacitance thereby increasing the bandwidth. Reverse biasing also introduces noise current, which reduces the S/N ratio. Therefore, a reverse bias is recommended for higher bandwidth applications and/or applications where a wide dynamic range is required. 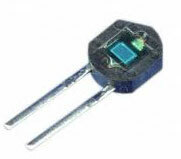 A PN photodiode is more suitable for lower light applications because it allows for unbiased operation. This has Hundreds or thousands photodiodes of typical sensitive area 0.025mm x 1mm arranged as a one-dimensional array. It can be used as a position sensor. One advantage of photodiode arrays (PDAs) is that they allow for high speed parallel read out. These have both Photodiode and IR LED in one pack.These may be Broken beam type of Reflective type. The Photodiode and the IR LED are arranged face to face with a slit in between them. When an obstacle like a moving belt in a conveyor, passes through the slit, IR beam breaks and circuit triggers. In this type, the Photodiode and IR LED are placed on the front side of the module. IR LED emits IR rays continuously. When an obstacle comes in front of the IR beam, it reflect back to the Photodiode and circuit triggers.Range of this reflection is minimum between 1 to 10 cms.